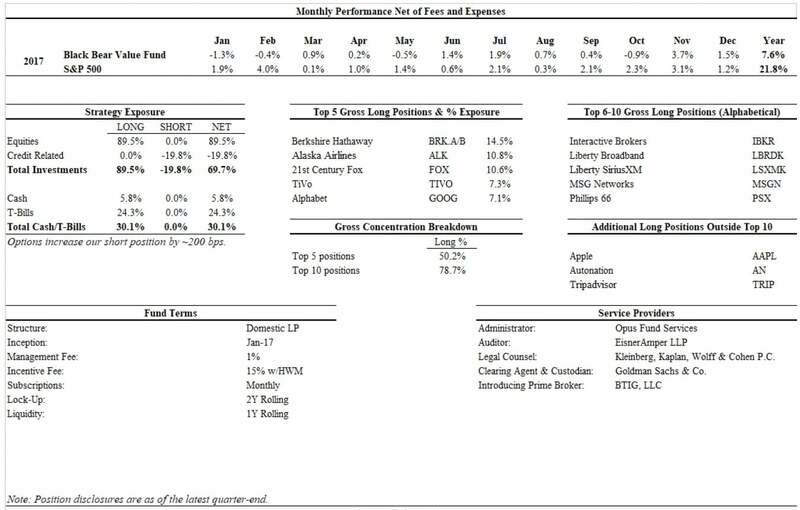 Black Bear Value Fund, LP is an opportunistic, concentrated and fundamental value investment partnership. The Investment Manager seeks to preserve capital and achieve long term capital appreciation with sensible risk by focusing on the margin of safety of an investment. We view risk as the probability of permanent loss of capital, not the temporary swings in a security’s market price. We actively seek undervalued and concentrated investments in the stock and bond markets that can be purchased at discounts to their intrinsic value/recovery value. We employ a tax efficient approach given our long-term investment horizon. The Fund is managed by Adam Schwartz who has 14 years of buy-side investment experience in a variety of themes including equities, structured products, corporate credit and capital structure arbitrage. Prior to founding the Investment Manager, Adam served as a Director and senior member of the investment team at Fir Tree Partners, a $13BB peak-AUM multi-strategy investment manager (2007-2015). Prior to joining Fir Tree, Adam was an Investment Analyst at LibertyView Capital Management, a multi-strategy investment fund within Lehman Brothers, as well as at Kore Advisors, an investment fund seeded by Paloma Partners. Adam received his BS and MS with a concentration in Accounting from Washington University in St. Louis in 2001/2002.